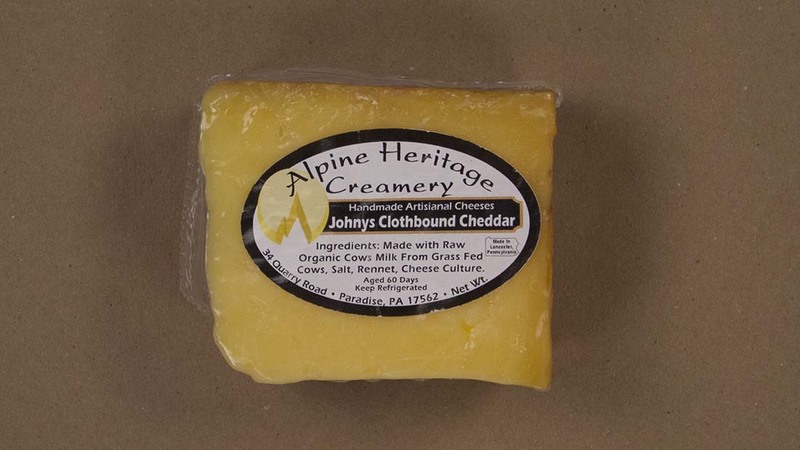 Johny's Clothbound Cheddar: Approx 14-20 months old. 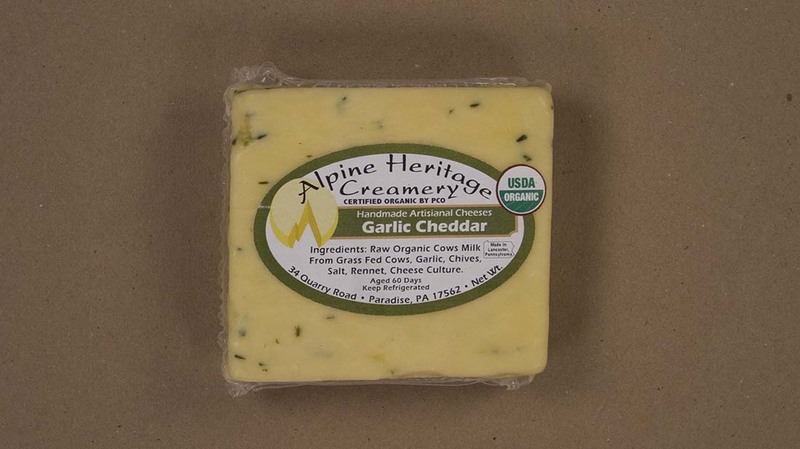 An Alpine Heritage original with a big, long lasting flavor. Traditional English cloth binding and cave aging brings our 100% grass fed Jersey milk to life! 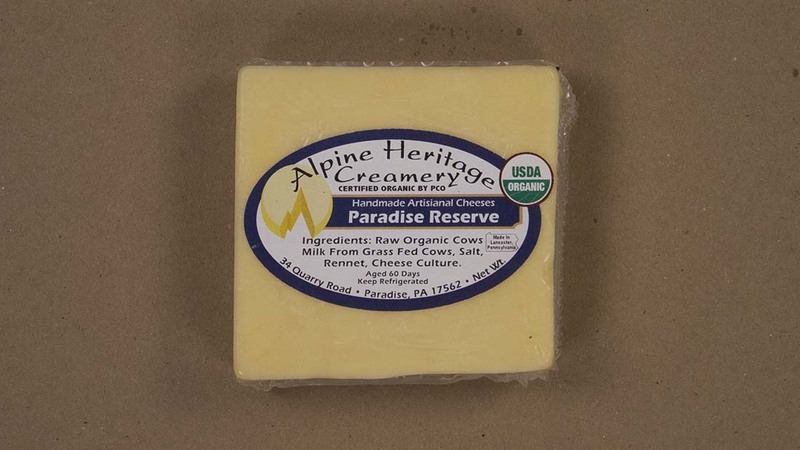 Notes of everything from pineapple to root vegetables come together in this complex cheese. Paradise Reserve: Approx 1-2 years old. A full bodied Cheddar with a complex flavor. Smooth and buttery up front but with the classic Cheddar bite on the finish, all with a tangy aroma that comes from the creamy milk of our 100% grass fed Jersey cows. Great melted or accompanied by figs and green grapes on your next cheese plate. Pepper Jack: Aged approx 2-6 months. A tart and spicy Pepper Jack with just the right amount of heat. Just enough chiles to give you a little kick but not so many that they overwhelm your palette or our creamy grass fed Jersey milk. An ideal melter. 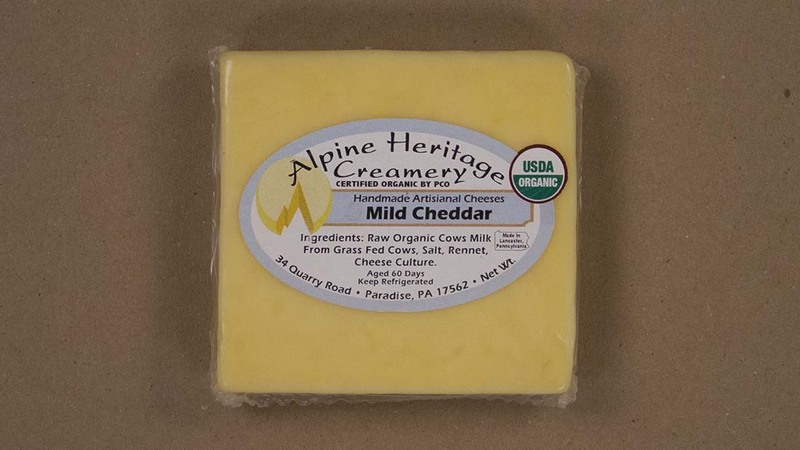 Mild Cheddar: Aged approx 2-4 months. This young cheddar is as perfect melted on a turkey club as it is on your next cheese plate with candied nuts and grapes. 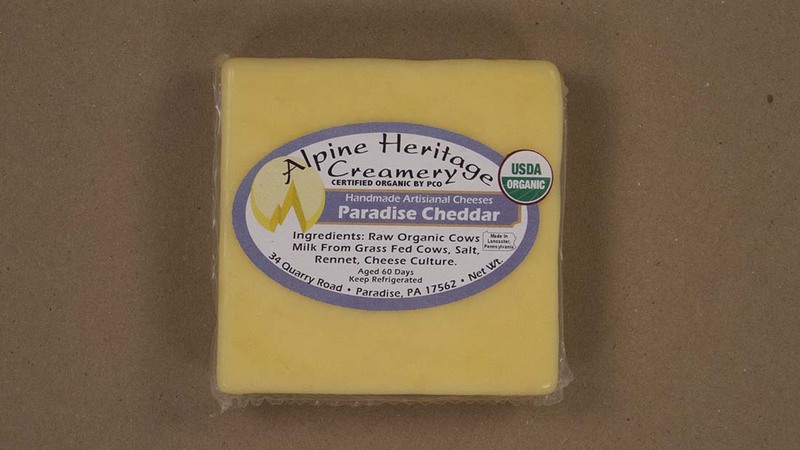 Paradise Cheddar: Aged approx 6-10 months. This medium cheddar is for those who prefer a bolder flavor. Still smooth but with a bigger bite at the finish. Great with cured meats and as a sandwich cheese. 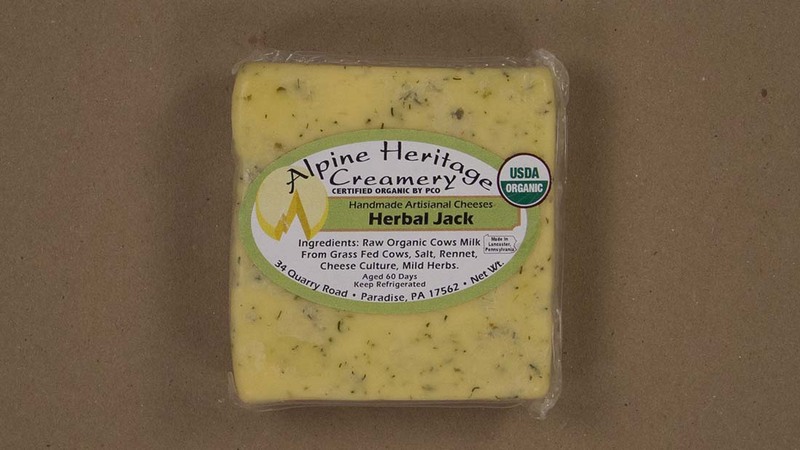 Herbal Jack: Aged approx 2-6 months. Our classic Jack recipe with the addition of a mild Italian herb and aromatic dill weed mixture. 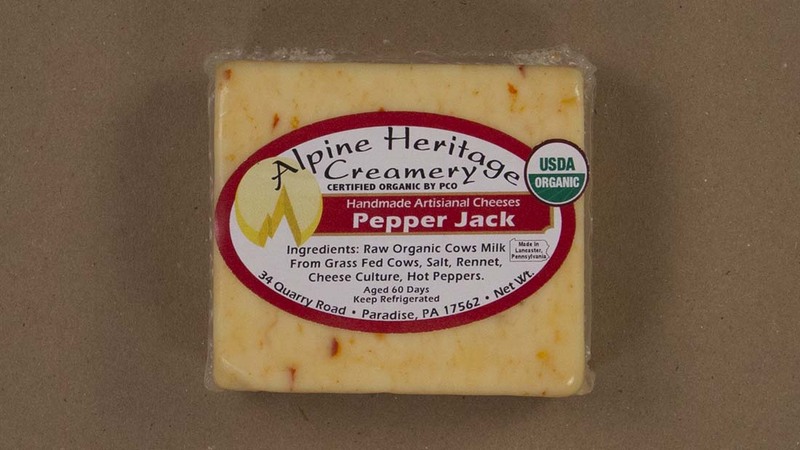 Prefect for your next grilled cheese or alongside sliced apples and pears on a cheese plate. 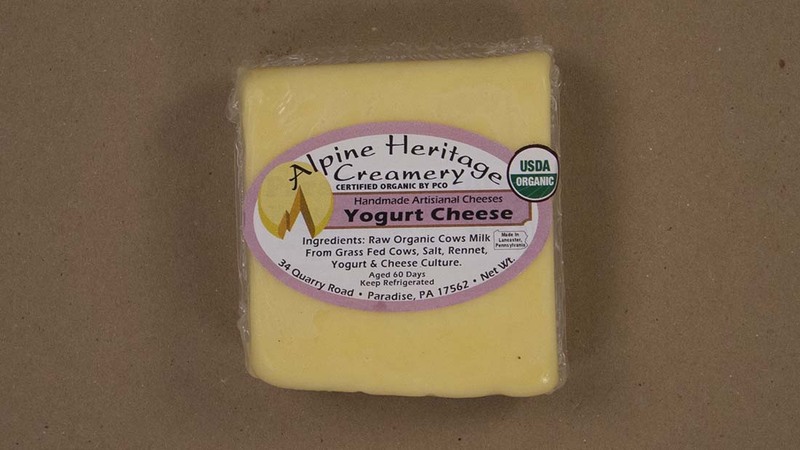 Yogurt Cheese: Aged approx 2-6 months. A classic cheese with a nice springy texture. A sweet aroma reminiscent of warm butter. Mild but with a full round flavor and a tangyness that makes it an ideal partner for cured meats or pickles. Garlic Cheddar: Aged approx 4-8 months. Our signature cheddar with the addition of organic granulated garlic powder and dried chives. A powerful cheese with a flavor that finds a balance between the flavor of garlic and the creamy rich flavors found in our Jersey milk. The perfect cheese to top your burgers. Dutch Country Swiss: Approx 3-8 months old. 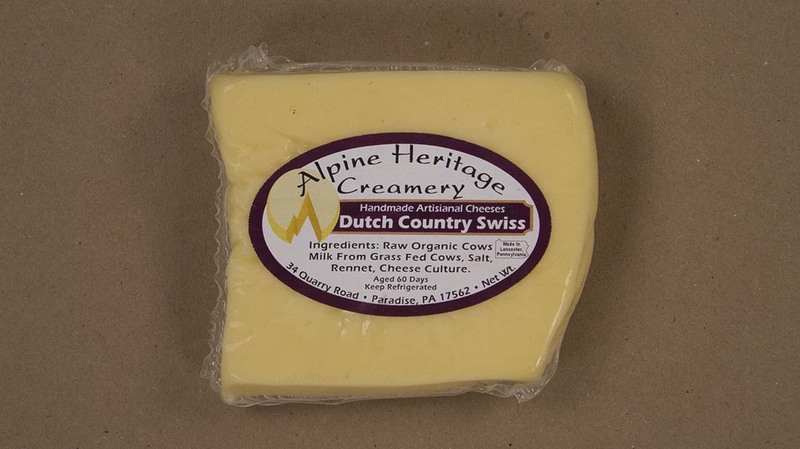 This Alpine Heritage Swiss cheese is unique in that it boasts the rich, creamy aroma of our Jersey milk and a mild, almost sweet flavor. Perfect for melting or as a simple snack with crackers or some nice crusty bread. 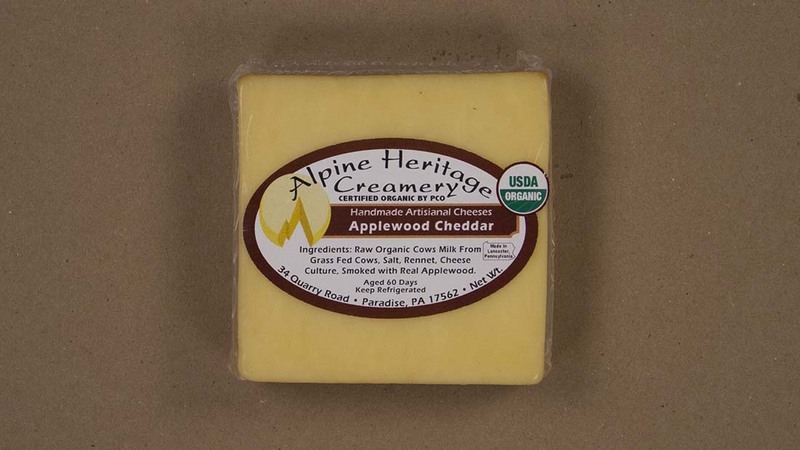 Applewood Cheddar: Aged approx 4-8 months. Our signature Cheddar smoked over apple wood for a more robust flavor. The hint of smoke makes this cheese ideal with cured meats. 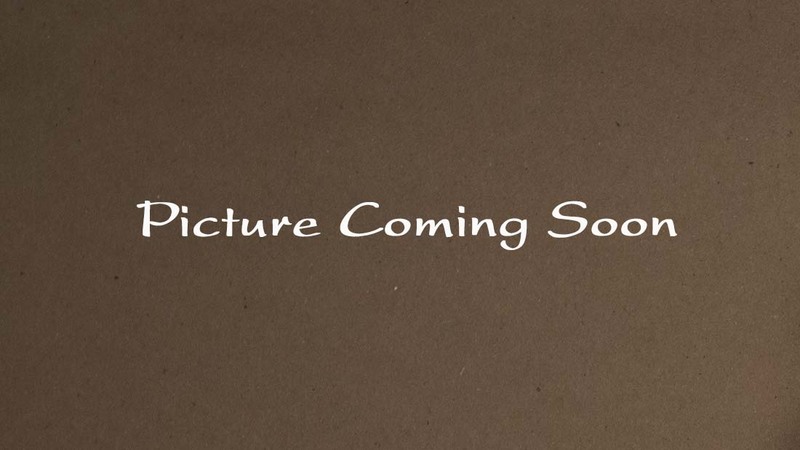 pickled vegetables and or melted over a burger or in a grilled cheese sandwich. Paradise Colby: Aged approx 2-6 months. 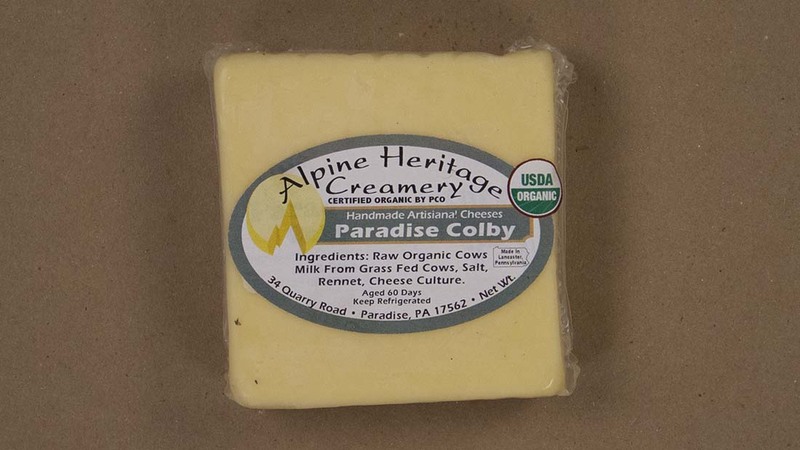 A classic farmstead Colby with a smooth buttery flavor and grassy aroma that comes from our 100% grass fed organic Jersey milk. A classic snacking cheese with a wide variety of applications from mac and cheese to your next cheese plate. Crunchego: An aged sheep's milk cheese, with a powerful flavor and a crystalline texture. This cave aged Manchego style boasts a grassy and buttery flavor with the classic sheep's milk tang that makes it an ideal partner for cured meats or olives.